The project began in 2007 when, motivated by a desire to fulfill founder June Callwood’s dream of offering a day health program to meet the needs of people living with HIV/AIDS, and realizing that they had outgrown their Huntley Street home, Casey House hosted a competition to find an architect to design their new facility. 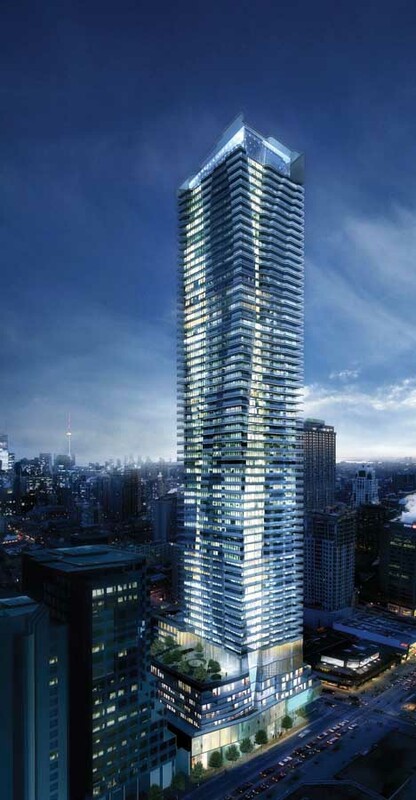 Siamak Hariri, Founding Partner of Toronto based Hariri Pontarini Architects, was chosen for the project. 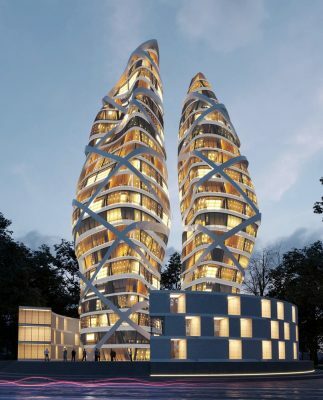 The architecture is a physical manifestation of the embrace in both the vertical and horizontal planes. 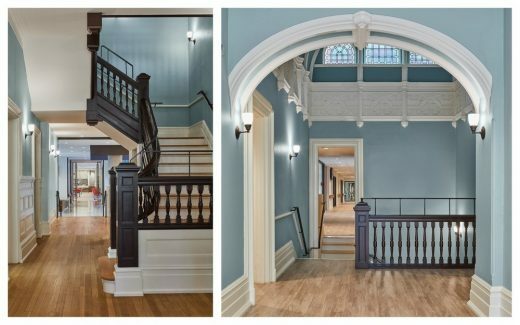 The new 59,000-square-foot extension reaches over and around the existing heritage designated Victorian mansion, which has been restored by ERA Architects. The new addition—a robust, textured exterior— surrounds the central courtyard. Beautifully landscaped and alive, the courtyard is visible from every corridor and in-patient room. 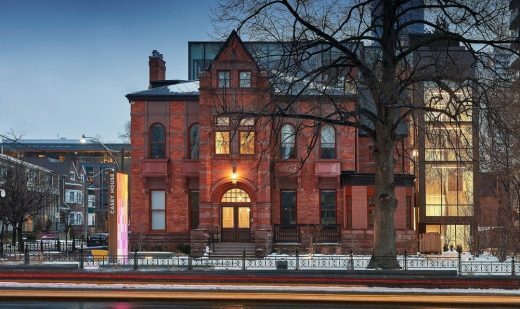 As one of the original mansions to be built along Jarvis Street, the retention of the existing 1875 building (known colloquially as the “Grey Lady”) maintains the original character of the street, while the addition introduces a dignified juxtaposition of the old and new. 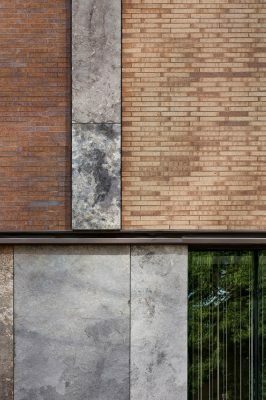 The façade, consisting of a palette of various brick, heavily tinted mirrored glass, and crust-faced limestone, is highly particularized and rich, and becomes the architectural manifestation of the quilt. Once inside, the experience is about engagement of the old and new, and the organization—the embrace—around the courtyard, which is the ever-present symbol of life-affirming green, water, and light (trees, fountain, and sunlight). Emphasizing the relationship between the old and new, the heritage building’s brick remains exposed in the Living Room. This central gathering space, featuring a two-storey atrium, is anchored by a full-height fireplace crafted from Algonquin Limestone. A bridge connects the heritage and new spaces on the second floor with long views from end to end. 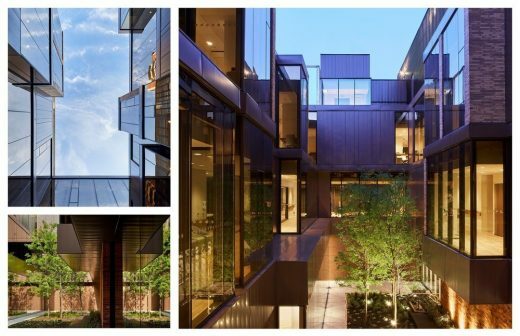 The courtyard allows direct sunlight into the core of the building on all floors. 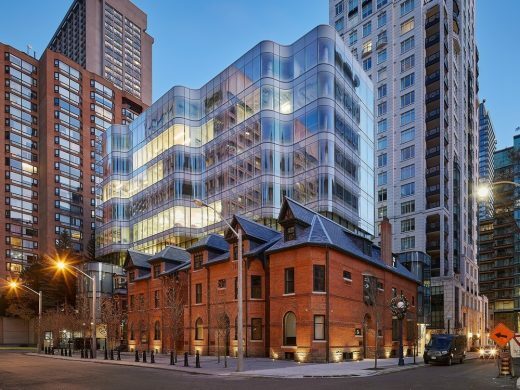 Given the private nature of the facility, it provides protected outdoor space for users, as well as transparency and clear sightlines across the project. The courtyard is also visible from each of the 14 private bedrooms (12 regular care and 2 respite beds) on the third floor. Sustainable features were inherently related to the patients’ healthcare and were thus seamlessly integrated into the design. 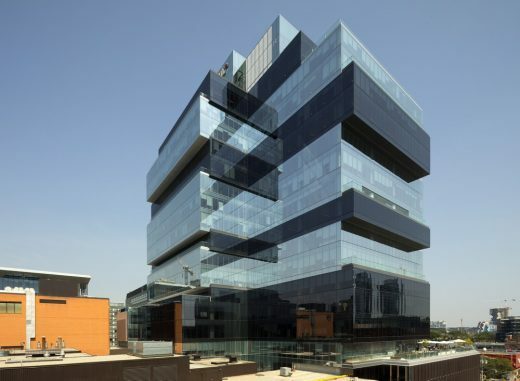 Green spaces, high efficiency tinted glass, cross-ventilation via the courtyard and operable windows, bike racks, rain water collection cisterns, and locally sourced and reclaimed materials also add to the sustainability profile of the project. “In the eighties, during the HIV crisis, there was huge stigma – as there is today – around HIV, and our facility was in the shadows of this community,” says Joanne Simons, Casey House CEO. “Nearly 30 years later, we’re making a very bold statement. 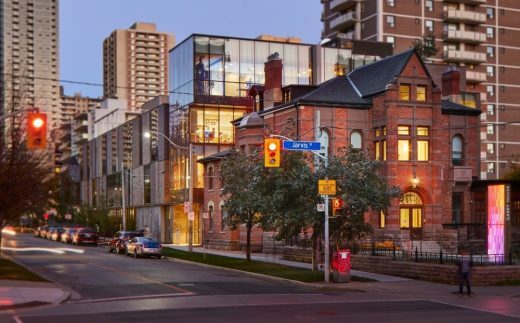 We’re not hiding anymore.” The new facility, standing proudly at the corner of Jarvis and Isabella Streets, marks a well-deserved moment of victory for Casey House in their fight against HIV/AIDS and provides intimate dignity for patients—a space where humanity and care are at the forefront of the patient experience. 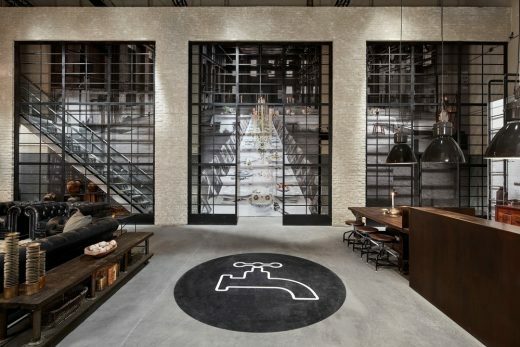 Heritage Consultants: ERA Architects Inc.